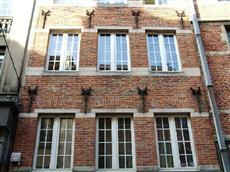 - 37 rue marché aux Poulets (6st floor) : 80m² (max 6 persons). Our apartments have an elevator, a fully equipped kitchen, a bedroom with a double bed and a 2 persons bed settee (The bigger one has also a 2 persons inflatable bed). RentByNight has not his own restaurant but you could cook in the apartment or there is a lot of restaurant in the area.